Is your PDF document really technically accessible? 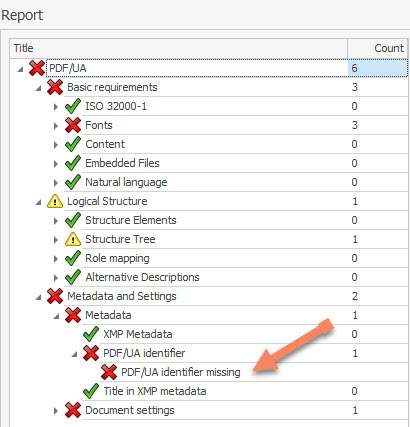 Have you checked to see if the PDF/UA identifier has been set? This enables reader applications and assistive technologies to fully process PDF/UA conforming files to maximize accessibility. By adding the PDF/UA identifier, you are claiming that the PDF document conforms to the structure elements as stated in ISO 14289, the informal name for the International Standard for accessible PDF technology. NOTE: If PDFs were created in Microsoft Word 2013 for Windows or in any version of Adobe InDesign, you definitely need to add the PDF/UA identifier. 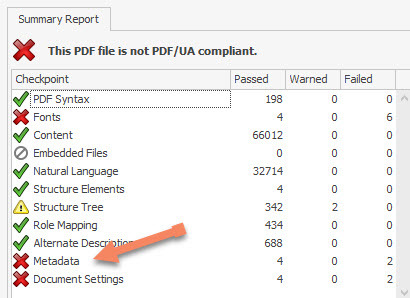 How can you tell if the PDF/UA identifier has been set in a PDF? Download PAC 3, one of the most comprehensive free testing tools that checks PDF documents for compatibility with the PDF/UA standard. Distributed by the Swiss organization Access for all and only available for Windows, PAC 3 evaluates the failure conditions that should be tested by other software apps. It also includes a screen reader preview tool to check the failure conditions which need to be tested manually. 1. Download and launch PAC 3. 2. Click the Upload button to select the PDF you want to test. 3. In the Summary Report, if you see a red X to the left of Metadata, this means the PDF/UA identifier is missing. 5. On the Report screen, click the arrow to the left of Metadata and Settings, then the arrow to the left of Metadata, then the arrow to the left of PDF/UA Identifier. If you see a red X to the left of the option PDF/UA identifier missing, this means the PDF/UA identifier needs to be added to the document. You can fix this using Adobe Acrobat DC. 1. Open the PDF document in Adobe Acrobat DC. 3. In the Preflight dialog, be sure PDF Standards is selected from the dropdown. 4. Activate the wrench icon above the list of Preflight checks. This should open the Document info and Metadata settings. 5. 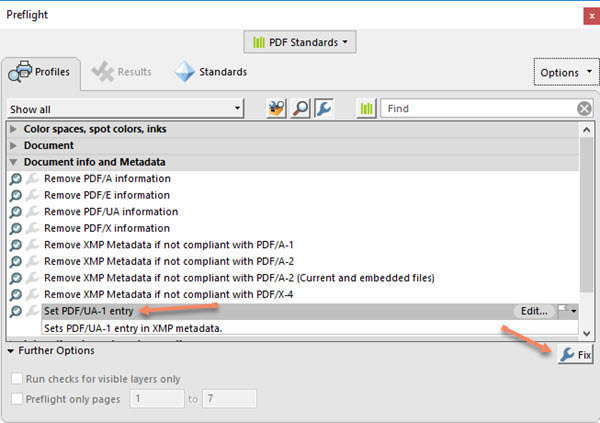 Select the Set PDF/UA-1 entry option, then click the Fix button. 6. In the next dialog box, you will need to re-save your file with a different name. To check to see if the PDF has been updated with the PDF/UA identifier, return to the PAC 3 app. 1. Go back to the PAC 3 app. 2. Click the Upload button to select the revised PDF you want to test. 3. 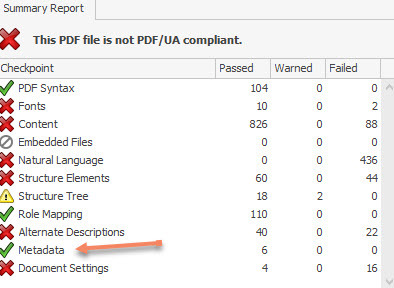 In the Summary Report, if you see a friendly green check mark to the left of Metadata, this mean the PDF/UA identifier is now part of the PDF document.